Banking in India, in the modern sense, originated in the last decades of the 18th century.The largest bank, and the oldest still in existence, is the State Bank of India (S.B.I).This was one of the three banks funded by a presidency government. The three banks were merged in 1921 to form the Imperial Bank of India, which upon India’s independence, became the State Bank of India in 1955. In 1969 the Indian government nationalised 14 major private banks. In 1980, 6 more private banks were nationalised. 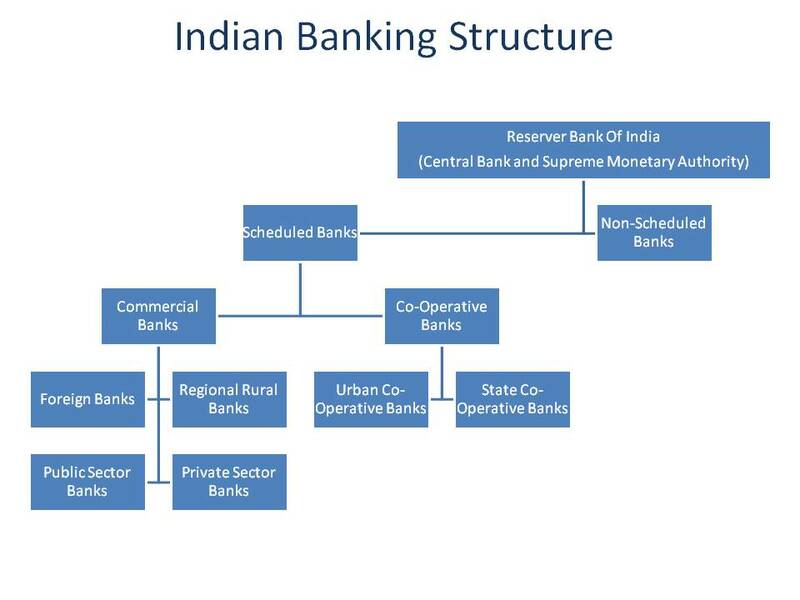 The Indian banking sector is broadly classified into scheduled banks and non-scheduled banks.All banks included in the Second Schedule to the Reserve Bank of India Act, 1934 are Scheduled Banks. These banks comprise Scheduled Commercial Banks and Scheduled Co-operative Banks. Scheduled Co-operative Banks consist of Scheduled State Co-operative Banks and Scheduled Urban Cooperative Banks. A commercial bank is a profit-seeking business firm, dealing in money and credit. It is a financial institution dealing in money in the sense that it accepts deposits of money from the public to keep them in its custody for safety. So also, it deals in credit, i.e., it creates credit by making advances out of the funds received as deposits to needy people. It thus, functions as a mobiliser of saving in the economy. A bank is, therefore like a reservoir into which flow the savings, the idle surplus money of households and from which loans are given on interest to businessmen and others who need them for investment or productive uses. Commercial banks have to perform a variety of functions. These can be broadly divided into two categories: (a) Primary functions and (b) Secondary functions. (c) Collection of Dividends on Shares and debentures of their customers and credit them to their accounts. (d) Acts as Correspondent: They get passports, traveller’s tickets and even secure air and sea passages for their customers. (e) Income-tax Consultancy: Banks may also employ income tax experts to prepare income tax returns for their customers and to help them to get refund of income tax. (f) Execution of Standing Orders of their customers for making various periodic payments. They pay subscriptions, rents, insurance premia etc., on behalf of their customers. (g) Acts as Trustee and Executor: Banks preserve the ‘Wills’ of their customers and execute them after their death. (b) Traveller’s Cheques and Credit Cards: Banks issue traveller’s cheques to help their customers to travel without the fear of theft or loss of money. With this facility, the customers need not take the risk of carrying cash with them during their travels. (c) Letter of Credit: Letters of credit are issued by the banks to their customers certifying their credit worthiness. Letters of credit are very useful in foreign trade. (d) Collection of Statistics: Banks collect statistics giving important information relating to trade, commerce, industries, money and banking. (e) Acting Referee: Banks may act as referees with respect to the financial standing, business reputation and respectability of customers. In recent years, commercial banks, particularly in developing countries, have been called upon to help achieve certain socio-economic objectives laid down by the state. For example, the nationalized banks in India have framed special innovative schemes of credit to help small agriculturists, village and cottage industries, retailers, artisans, the self employed persons through loans and advances at concessional rates of interest. Banks are the most important financial intermediary in an economy. Banks performance can be analysed by its balance sheet and profit and loss account. Bank publish balance sheet in their annual accounts. The balance sheet of a commercial Bank is a statement of its liabilities and Assets at a particular time. Liabilities show the sources of funds through which bank raises funds for its business. Assets represents uses of funds to generate income for bank. 2) Reserves and surplus 2) Money at call and short notice. c) Saving Deposits 3) Bills discounted, including treasury bills. A commercial bank has to manage its assets and liabilities with three objectives in mind, namely :- Liquidity, profitability and solvency. Liquidity means the capacity of the bank to give cash on demand in exchange for deposits. But a commercial bank is a profit – seeking institution. It has to arrange its assets in such a way that it makes maximum profits. The bank should also maintain the confidence of public by making cash available on demand. Liquidity and profitability are, therefore, conflicting considerations for bankers. Cash has perfect liquidity but yields no return at all, while other income-yielding assets such as loans are profitable but have no liquidity. The bank should strike a balance between liquidity and profitability. Another consideration of the bank is its own solvency and security. This refers to liquidity and shiftability. Liquidity is the capacity to produce cash on demand. Shiftability means the assets acquired by bank should be easily shiftable to other banks or central bank. Those securities would be preferred by a bank which can be shifted easily without any loss to the bank than the risky and more profitable ones. A bank which is solvent may not be liquid. Its assets may exceed its liabilities, but the assets may not be in such a form that they are readily convertible in to cash. Thus, the two motives of a bank’s liquidity and profitability are contradictory, but have to be reconciled. A good banker is one who follows a wise investment policy and distributes the assets in such a way that both the requirements of liquidity and profitability are satisfied. The assets should bring in maximum profits and should provide maximum security to the depositors. The secret of success of a bank lies in striking a sound balance between liquidity and profitability. Cash balance have perfect liquidity, but no profitability. Cash is held to meet the withdrawl needs of depositors. Surplus cash of commercial banks is lend to each other. This earns some interest and is also very liquid. Statutorily banks have to invest a part of their assets in government securities. These securities have low rate of interest but banks can borrow from RBI against these securities. Thus investment in securities provide returns as well as liquidity to bank. Here liquidity is low but profitability is high. Thus banks hold various assets in such a way that the requirements of liquidity and profitability are balanced. Since nationalisation of banks in 1969, the banking sector had been dominated by the public sector. There was financial repression, role of technology was limited, no risk management etc. This resulted in low profitability and poor asset quality. The country was caught in deep economic crises. The Government decided to introduce comprehensive economic reforms. Banking sector reforms were part of this package. In august 1991, the Government appointed a committee on financial system under the chairmanship of M. Narasimham to recommend the initiatives required to strengthen the Banking and financial systems on the lines of international best practices. Even as the first set of recommendations were getting implemented , the Government felt the need for commissioning the committee once again in 1999 for a review and recommending further reform measures in the wake of developments in the global arena. In the pre-liberalisation era, the banks’ ability to lend was constrained by pre-emption of substantial resources by way of Cash Reserve Ratio and Statutory Liquidity Ratio which were ruling at as high a level as 15% and 38.5% respectively. In simple terms, it meant that out of every deposit of Rs.100/- mobilized by the banks the amount available for lending was only Rs.47.50. In acceptance of the committee’s recommendations in this regard these ratios were gradually reduced post-1991 and as of now, the CRR stands at 4% and the SLR at 21%. In fact, by an amendment to the RBI Act in the year 1997 , he minimum CRR stipulation of 3% was done away with. The reduction in CRR and SLR proved to be a game changer by putting more money in the hands of Banks for lending. Prior to the introduction of this measure, banks were booking interest income on the their credit portfolio on accrual basis without any reference to the recovery or otherwise of the interest applied in the borrower’s account. With the result, the banks showed inflated profits and the quality of credit in terms of its recoverability was not realistically reflected in the Bank Balance Sheet. With the introduction of IRAC norms, Banks were required not only to de-recognise interest not recovered in the borrowal accounts as income but also to make prudential provisions against profit for the non performing assets (NPAs) on the basis of default history. This one measure has resulted in a great improvement in the operational efficiency of the Banks through better credit discipline and improved credit monitoring. Hitherto, the ability of the Banks to lend was determined by the amount of deposit mobilized by them and it was not linked to any minimum capital requirements. This had the effect of building assets beyond the sustainable level jeopardizing depositors’ interests in the event of a major default in lending portfolio. In line with the global best banking practices Capital Adequacy Norms (as suggested by the Basel Committee on Banking Supervision) were introduced for Indian banks also thereby linking their ability to expand credit/build up assets to the amount of individual Bank’s capital. Taking this initiative forward , the capital adequacy norms were further tightened on the basis of recommendations of 1999 Narasimham Committee by applying the Basel II requirements and with effect from the year 2013 Banks in India were required to move to Capital requirements under Basel III in a phased manner over a specified time frame and Capital Provisioning for Operational Risks has also been mandated. Though business of banking essentially consists of accepting deposits and lending, in the pre-reform era the banks did not have the power to decide on the interest rates for both deposits and advances as they operated in an administered interest rate regime. Thus there was no incentive for being professional and efficient since margin in any case was assured. How things changed with gradual dismantling of administered rate regime! In fact, initially when banks were allowed to quote their own interest rates on fixed deposits, not being comfortable with the newly acquired freedom, the banks took umbrage under IBA and decided that IBA will set the interest rates and all member banks would quote the same rates across the board. It required RBI to intervene and exhort them to find their own (market determined) interest rates based on their appetite for funds, lending opportunities available etc. Today, some of the banks offer as much as 6 to 7% interest on Savings Bank Balances as against 4% offered by many banks! Similarly, on the lending front the various interest rate prescriptions of RBI for Priority Sector Advances etc., have been withdrawn and the banks are free to determine the rates on their own for all advances of the value in excess of Rs.2,00,000/-. The initiative to deregulate interest rates led to the emergence of various concepts like Prime Lending Rate, Base Rate, Marginal cost Based Lending Rate etc., to ensure transparency in pricing of loan by banks. Many initiatives were put in place in this regard chief among them being establishment of Debt Recovery Tribunals for speedy disposal of recovery suits filed by the banks, enactment of SARFAESI Act, setting up of Asset Reconstruction Companies etc., Also notable among the other initiatives were the introduction of Corporate Debt Recovery Scheme (CDR) to deal with high value problem loans to the Corporate Sector in the year 2001 and, based on the review of its working, the recent announcement of a new scheme of Strategic Debt Restructuring (SDR) empowering Banks to effect change in Management of defaulting and non-cooperative Corporate borrowers . The process is a continuous one and the latest in this direction is the passing of Bankruptcy Code by the Parliament which, when implemented, is expected to help in speedier resolution of problem loans. From the year 1969 when the Banks were nationalized and till 1994, no new players in the private sector were licenced to set up a Bank . Banking was almost the monopoly of Public Sector Banks barring a few Banks in the Private Sector that were already in existence. Thanks to the Banking sector reforms, in the year 1994 alone, six banks in the private sector were given licence to operate which included, among others, ICICI Bank, HDFC Bank and UTI Bank (which took a new name later as Axis Bank) and IDBI Bank. Armed with the latest Banking technology and with no legacy baggage how these banks transformed the entire banking and took it to a new level is too well known a story to need a repetition here. The rules for entry of foreign banks in India were also relaxed substantially resulting in competition from foreign banks too forcing the PSBs to pull up their socks and improve the way of working to survive and protect their turf against onslaught by the competitors. In fact, PSBs have lost considerable market share to their new generation competitors in the private sector. In the year 2003 two more banks, namely, Yes Bank and Kotak Mahindra Bank Ltd., were given banking licence to operate followed by two more banking licences for Bandhan Bank Ltd., and IDFC Bank Ltd., in 2014. Taking the reform measures further in this space, RBI has promoted differentiated banking by granting licences to 11 players for setting up Payment Banks and 10 payers for setting up Small Finance Banks in the year 2015. These new niche banks are expected to commence operations before the end of 2016. Today, the bank customer has a wide range of banks to choose from on the basis of their specific banking requirements, efficiency of operations of the banks and the quality of customer service. With the change in the rules of the game towards capital adequacy and given the constraints of the Government to continuously provide additional capital to banks due to its implications on the fiscal front, the Banks have been given freedom to access capital markets to support their capital requirements for business growth. This has been facilitated through suitable legislative changes providing for dilution in Government stake in PSBs from 100% upto 51% so that the Management control could still vest with the Government. Today, there is practically no bank in the Public Sector whose shares have not been listed in any of the Stock Exchanges. The status of a listed entity has exposed the banks to the rigours of market discipline . Though the Narasimham Committee recommended for phased withdrawal of guidelines on mandatory lending to priority sector, keeping in view the importance of bank credit to this sector towards the socio economic development objectives the Government on the lines of recommendations by Nair Committee on Priority Sector Lending (Chairman: Mr. M.V. 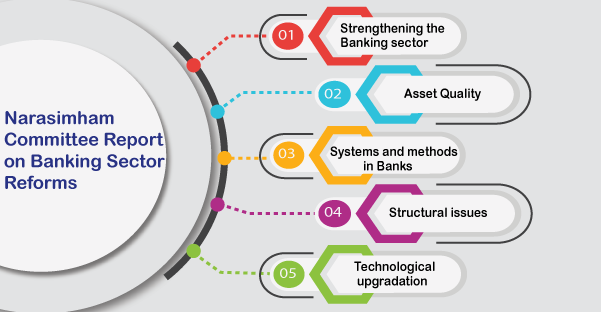 Nair) revised and broad-based the definition of Priority Sector to include newer activities which require credit support and to facilitate active participation of the Banks in achieving the lending target under this sector. (iii) Local Area Banks for primarily Region specific Banking. In pursuance of this objective, the two Term Lending Institutions (also called as DFIs) were allowed to be converted into Universal Banks. Whereas ICICI , through a reverse merger process, merged with ICICI Bank floated by it earlier IDBI converted itself to a Commercial Bank in which it absorbed the bank it floated earlier in 1994 under the same name. The other consolidation witnessed during the reform era has been the merger of Global Trust Bank with Oriental Bank Commerce for reasons strictly not related to consolidation efforts; similarly, another New Generation private sector bank, The Bank of Punjab Ltd., merged with the Centurian Bank Ltd., and the merged entity was later taken over by HDFC Bank. ICICI Bank also took over Bank of Madura Ltd. to increase its presence in the Southern parts of the country and later merged two other Banks, namely, Sangli Bank Ltd., (2007) the ailing Bank of Rajasthan (2010) with it. The post-reform era saw the removing the dividing line between development banking and commercial banking and the commercial banks have increasingly started engaging in long gestation term loan projects and infrastructure lending. The liberalization process emboldened some of the strong banks to specialize in activities like Loan Syndication, Wealth Management services etc. The banks were also permitted to foray into newer areas of financial services like mutual fund and insurance by either acting as Corporate Agents for selling specific insurance / mutual fund products of other Insurance and Mutual Fund Companies or by floating Mutual Fund and Insurance subsidiaries by forging alliance with Global players of repute in the respective fields. These initiatives enable the banks to have different streams of income to supplement to the income from the regular banking business. In the wake of extensive bank liberalization and more emphasis on self-regulation by banks , the responsibility of RBI as the controller of banks has become more onerous. In recognition of this fact, a number of steps have been initiated chief among them being establishment of an exclusive Department for Banking Supervision and implementing many of the recommendations of successive Basel Committee Reports on Banking Supervision and issuing exhaustive guidelines on Risk Management Policies and Practices, Asset Liability Management, Capital Provisioning, compliance etc., which are aimed at strengthening the banking system to withstand the challenges of any future economic/ financial sector crisis. The details guidelines given by the RBI in its communications on Basel III compliance covers all the three pillars namely, minimum capital requirement, supervisory review process and market discipline. Any study on Banking sector Reforms cannot be complete without a reference to the progress made on technology adoption by Banks in recent times. The initiatives on the technology front has enabled the Banks to play a key support role to the Government of India by way opening record number of Bank Accounts under Pradhan Mantri Jan Dhan Yojana to enable direct transfer of social benefits under schemes like MNREGA, cash subsidy on LPGs etc., The technology capability is expected to enable the Banks to play a significant role in the financial inclusion efforts of the Government and RBI by providing cost-effective banking services to those at the bottom of the pyramid. In recent times, the Public Sector Banks have come under a lot of criticism on the mounting NPAs and many of the Banks have reported huge losses on the back of substantial provisions made for bad loans. In this context, the following observations made by a panel of banking experts in a public discussion forum organized by Centre for Policy Research , Delhi recently merits a mention: “ The sudden rise in NPA in PSBs is due to excessive lending to the infrastructure projects in 2010-11 which helped in boosting growth. So, if banks are attacked now for bad loans, they should also be given credit for helping growth at that time……….,” . The spurt in NPA is due to the attempts by banks to clean up their books by march 2017 as directed by RBI. The “Indra danush” plan announced by the Government addresses the issues currently faced by the PSBs and promises to correct the anomalies by recapitalizing banks, revamping Bank Boards and giving operational freedom, Governance reform and inducting professionals in Management positions selected through recently constituted Bank Board Bureau etc., These initiatives coupled with the expected pick up in the economic growth (which did slow down in the past couple of years due partly to policy paralysis ) , it is hoped, would enable the PSBs to come out of the present crisis and bounce back to great strength. The banks have shown resilience in the past and there is no reason why they will not do it again.